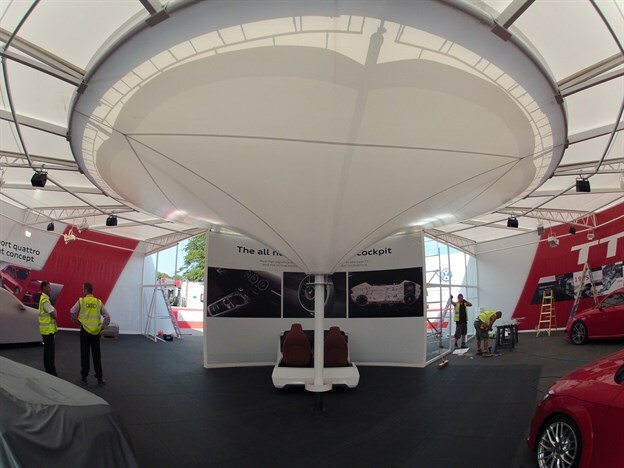 TensileFabric worked with Helm X, under Shelton Fleming, to create a number of fabric elements on this very open exhibition stand for Audi at Goodwood's Festival of Speed 2014. 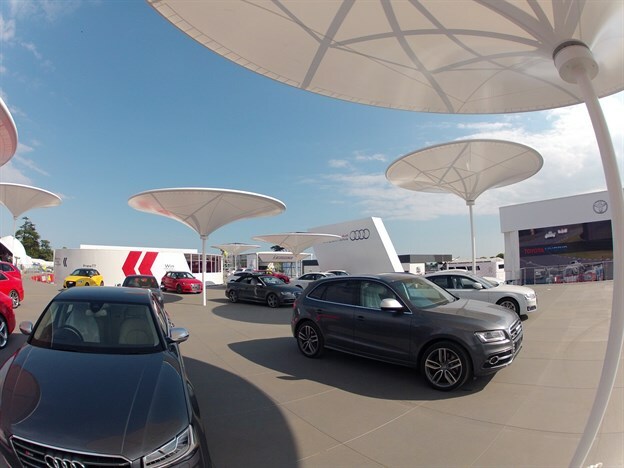 Audi was keen to show a wide range of their vehicles, including the new Audi TT, so they went with a very open format for their stand. 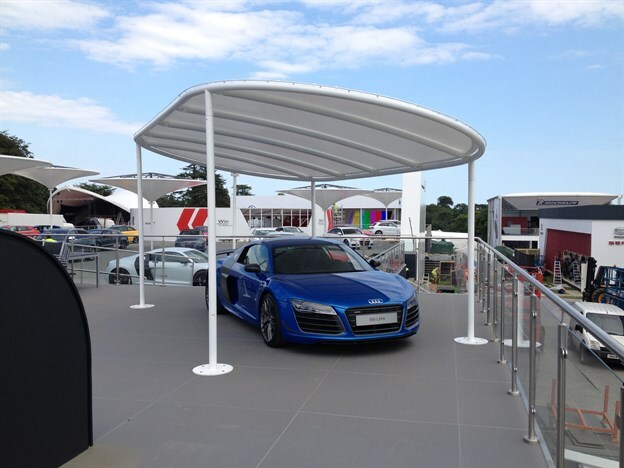 TensileFabric created the eye-catching inverted umbrella fabric forms (with Helm X providing the detailing and steel sub frame) where any rainfall is channelled down the central mast. 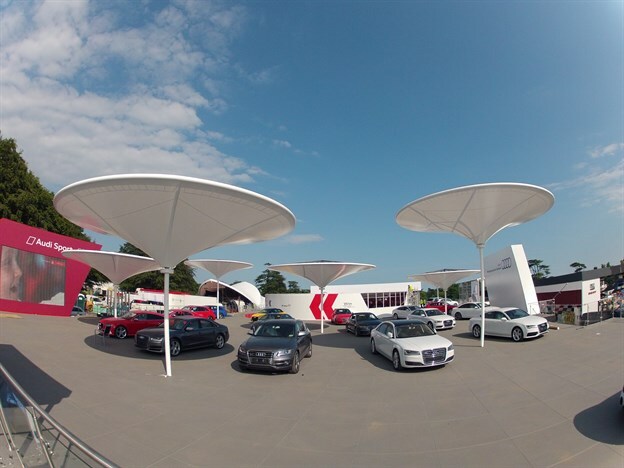 The seven structures not only provided rain protection but also offered fantastic sunshading, for what was a very warm event! Helm also created a number of huge rombus feature walls, one containing a video wall to which we added a white blackout fabric,(to prevent internal light spill from the internal framework) to create some strong forms on the stand. The client's graphics firm added logos to these panels. 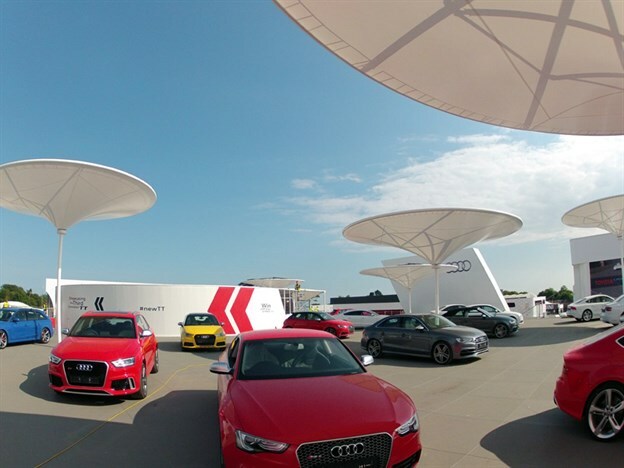 We created the fabric skin for the new Audi TT showcase area, which was a 20m dia drum form (created by Helm), where PVC fabric ceiling panels formed the roof, and further fabric wall linings, to produce a waterproof and air conditioned space. 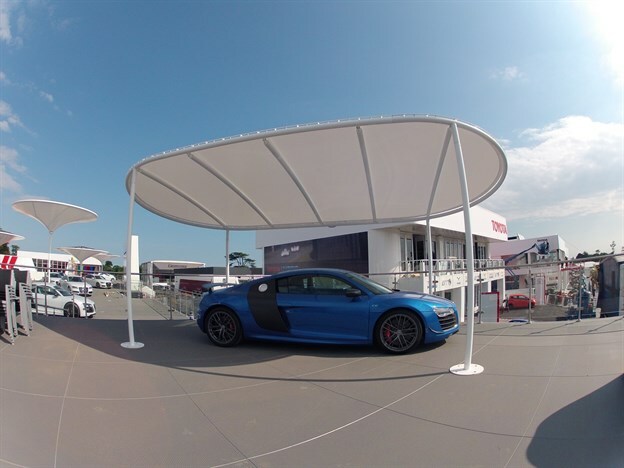 Finally a lozenge-shaped canopy was also produced to help draw attention to the R8 positioned underneath it. This uses a very simple edge detail - allowing for easy dismount and hopefully reuse!